Double-O means License To Kill. Hmm, wonder if there's a CBer who might fit that job description. As an aside, almost all of the reported ranges are "observed ranges" rather than "model limits". The traditional FICO, back in the dark ages, was 300-900 IIRC. Now various CC issuers and other score vendors use different ranges, but they almost all still give observed ranges rather than system limits. For all of them AFAIK the limits are even numbers, typically 250-800, 150-800, 300-900 etc. It is highly improbable to achieve either the bottom or top scores. For many collections scores, rarely disclosed, the ranges are inverse to the application scores more commonly reported. They're all still here, especially after a new post. Edit: Ah now I realize why, I didn't see the option to expand the other stickies. Citi never provides me with a score when i get denied for a cc, so I don't know what that chart is smoking. FYI, got a Equifax FICO from USAA. I'm guessing it's the BEACON 09 as the range is 300-850, though they don't identify which EQ score it is. I was approved for the card, but still got the disclosure. Perhaps my interest rate is higher. I think they use the Vantage Score. They must be the only one. I don't think so, probably a hybrid. The range of Vantage goes up to 990. If you get anything higher than an 850 in the range, it's not a FICO score. And anything below 300, it's not a FICO score. Not necessarily. 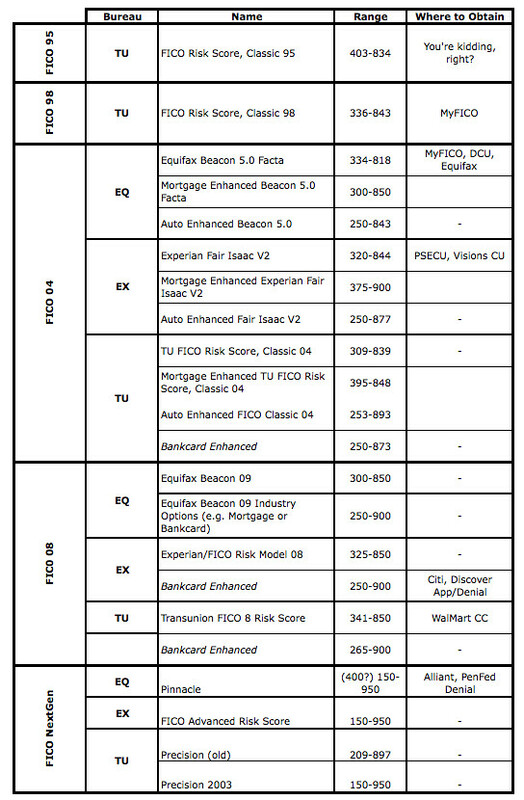 Some FICO industry options (eg bank card or mortgage enhanced go to 900, and some of the FICO nextgen scores have ranges from 150-950. Not sure if you guys discussed this elsewhere already but did you see that myfico is selling EX FICOs again? It sounds like they are FICO 08. EXP Fico 08 for Logix Credit Union, matched my score exactly with the one from myFico pulled to days earlier, it goes up to 850 according to Logix's document. Experian: Experian, FICO Risk Model V2 (classic, auto, bankcard, installment loan, personal finance). Equifax: BEACON 96 (classic, auto, bankcard, installment loan, personal finance). TransUnion: FICO Risk Score, Classic 98 (classic, auto, bankcard, installment loan, personal finance). Experian: Experian, FICO Risk Model V3 (classic, auto, bankcard, installment loan, personal finance). Equifax: BEACON 5.0 (classic, auto, bankcard, installment loan, personal finance, mortgage). TransUnion: FICO Risk Score, Classic 04 (classic, auto, bankcard, installment loan, personal finance). Experian: Experian, FICO Risk Model 08 (classic, auto, bankcard, mortgage). Equifax: BEACON 09 (classic, auto, bankcard, mortgage). TransUnion: FICO Risk Score, Classic 08 (classic, auto, bankcard, mortgage).